Participation – Bhagat is hosting a riot in the streets, and you're invited! Revel in true Anarch fashion with his alternate art connection card. In addition, each competitor receives a stunning commemorative 2017 North American Championship coin. Top Third – After the dust settles from the Swiss rounds, players who placed among the top third of all competitors will receive a set of five memory unit tokens. One can be used to represent an initial four memory units, and the other four are a useful tracking tool as you add to your slate of programs. Top 32 – The premium three-compartment deckbox, bearing the North American Championship logo, awaits those who ascend to the top 32 of final standings. Top 16 – A hefty medal will be draped around the neck of each competitor that ascends to the Top 16, bearing an inscription and game logo on its reverse. Finishing Placement – A stunning playmat featuring art from the Terminal Directive Campaign Expansion is awarded to each player who runs their way into the Top 8. Each playmat bears an icon displaying the rank its bearer finished the event with, including Top 8, Top 4, 2nd, and 1st. Top 4 – Each of these players will have the opportunity to build on their incredible performance at the World Championship by earning a free reserved seat next November! Finalist – A plaque commemorates an outstanding accomplishment, and is complimented by a bye at the World Championship in November! 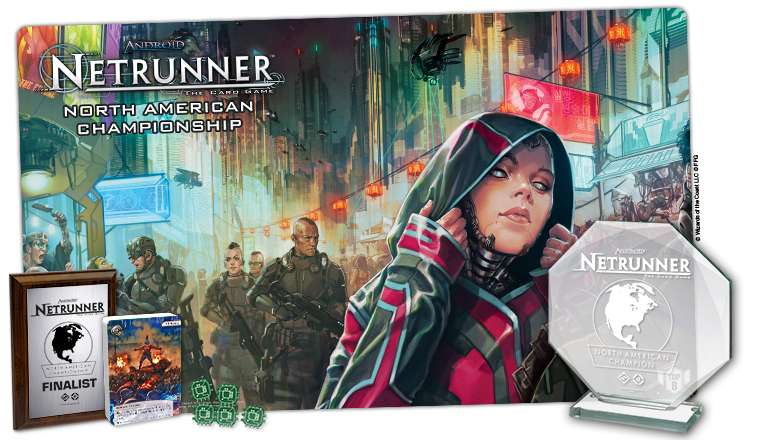 In addition to a radiant trophy, the North American Champion wins the chance to inspire the design of a future Android: Netrunner card! A free flight and hotel room for the next World Championship will elevate them to the pinnacle of competition, where they receive a bye in the first round. The champ is even allowed an additional free reserved seat, to bring a friend or companion to compete alongside them at Worlds. #20 Ulkrond Force of Will v11.47 20th Place CT Litmus Test v5 20th Place US Nationals.